I came across this recipe a while back on The Pioneer Woman's website and always wanted to try it. It was also on her show this past Saturday, which reminded me that I had to make this soon! The Pioneer Woman calls this pizza "Cowgirl Food". She says this type of food is "chick-friendly" and is food that you eat with just the girls when the cowboys are away. I think this recipe would be perfect with some cocktails for a girl’s night! I have never had a fig believe it or not, so I wasn't sure what the fig portion of the recipe would taste like. But I do love prosciutto, and of course cheese, so I didn't think it could be too bad. The fig jam is sweet and the prosciutto kind of salty, so it was a perfect combination. The only sad part is that I totally forgot to add the mozzarella on top of the fig jam layer. I was trying this recipe by memory and totally forgot. Don't be like me =( It was still good anyway and I didn't even realize I forgot this until I looked the recipe up to share with everyone. Either way it's a very tasty treat! Preheat oven to 350 - 450 degrees (follow the instructions if using a pre-made crust. Roll out pizza dough as thinly as possible. Place on a large baking sheet. Lay sliced of mozzarella all over the surface (please note I totally forgot to add this, which made me really sad, but it was still really good without it. I will make sure to add next time). Sprinkle lightly with salt and freshly ground pepper. Bake for 12 to 15 minutes (or follow directions on your pre-made crust), or until crust is golden and cheese is bubbly. Remove from oven and immediately lay prosciutto over hot pizza. Just before serving, sprinkle arugula/spinach and Parmesan shavings. 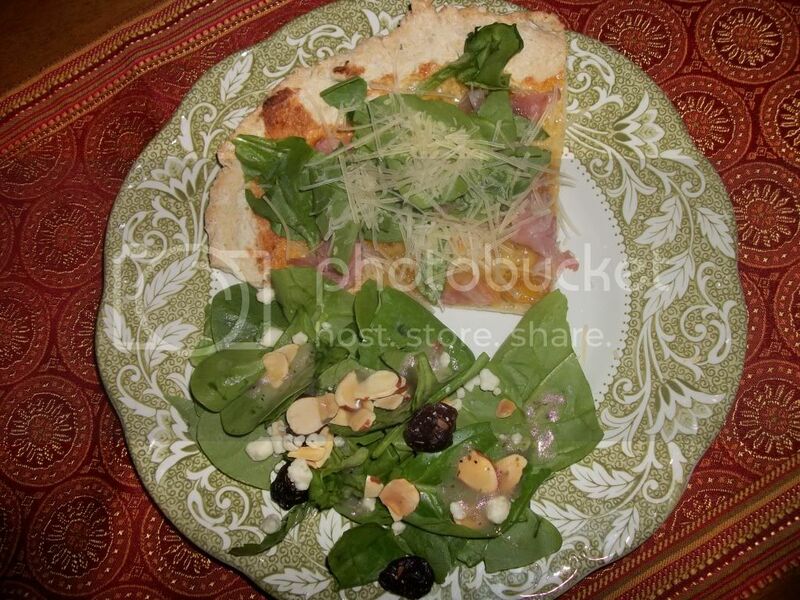 I served mine with the bagged spinach kit that included dried cranberries, sliced almonds and blue cheese...yum! Looks delicious! Fig jam reminds me of traveling through Egypt, since we had some with breakfast every day. My grandparents also had a fig tree in their backyard when I was growing up. Figs are one of my favorite fruits to this day! yum! sounds delicious. 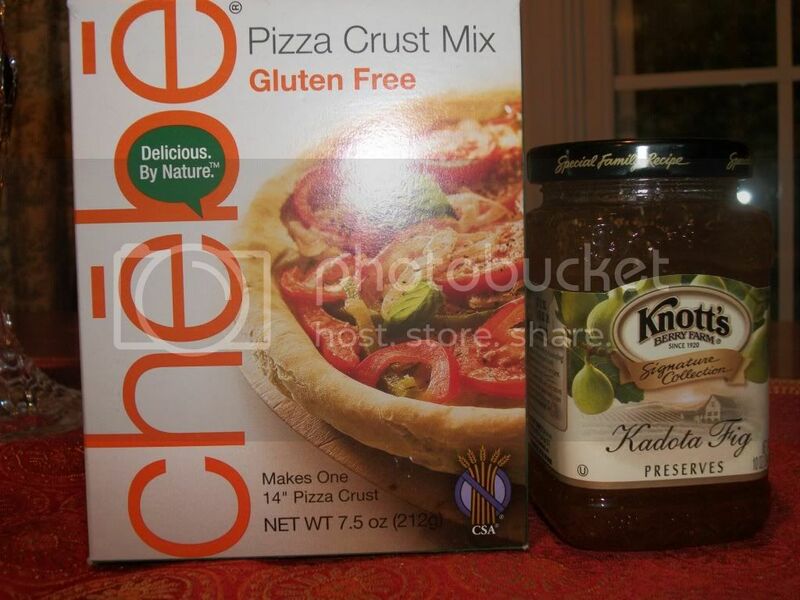 we make pizza once a week but the toppings are never this fancy...i need to try this recipe! xoxo jillian:: enter to win a knit cowl! Yum! 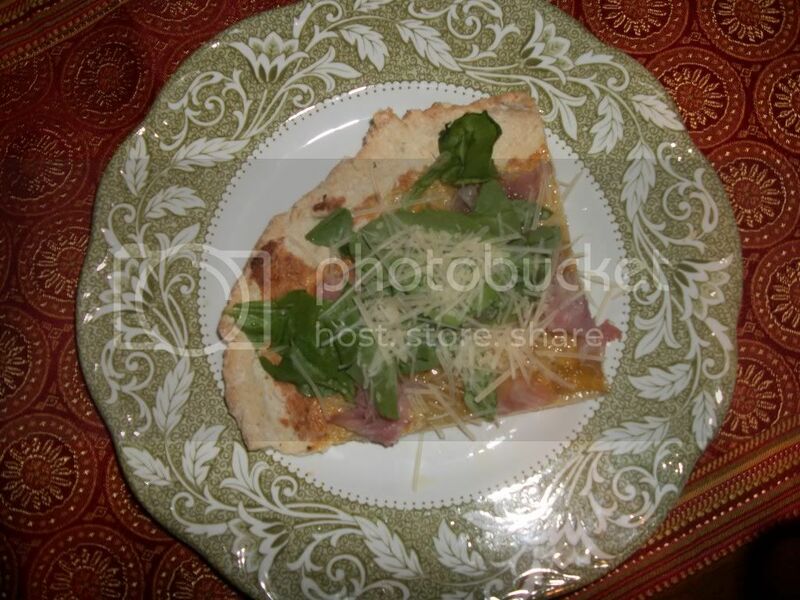 I had a pesto & prosciutto pizza over the weekend that was also really delicious!